With the JET Home in Champaign fully renovated, the Rubins settled into the heart of the University of Illinois campus and JET is off to a flying start in 2019. Students love coming to the Rubins for Shabbat dinner to taste home cooked meals and to make new friends. Exciting new programs are beginning in Champaign and in Chicago. There’s something for everyone. JET offers students a wide variety of trips throughout the year, in Israel, the US, and other countries – to learn, grow, have fun and meet other incredible people. JET runs challah bakes in Champaign and Chicago throughout the year. If you have a child who is a student or young professional in Champaign or Chicago, let us know and we’ll invite them to the next one. JET students Alison Perlman and Emily Kopka are sitting with Adina Mayer, coordinator of the Positive Speech Project as they begin their training to be student leaders at U of I. Alison and Emily will be running the Positive Speech Project at their sorority, AEPhi beginning next week. The other Postive Speech program will be running from the JET home. 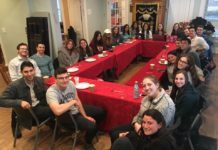 In addition, the renowned Maimonides Leaders Fellowship, a 10-week crash course in Judaism, returns to U of I on Tuesday, February 5th with international guest speaker, Rabbi Benzi Klatzko. 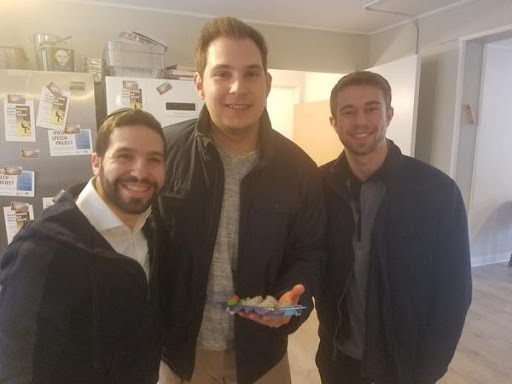 JET students Elan Karrol and Andrew Schwartz, both seniors at U of I, enjoy some sushi with Rabbi Rubin in the JET Home. 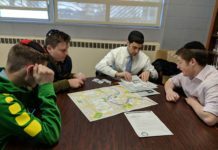 Each Tuesday this semester Rabbi Kahn will be in Champaign for Sushi and Shmoozing with Juniors and Seniors to see how he can assist as they prepare for life after graduation. 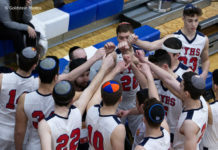 JET is not only about Jewish education. Through JET’s vast network of connections in Chicago, Israel, and around the world, JET helps students find summer and winter internships (through www.jinternships.com) and assist graduating seniors in the job search. If they move to Chicago, JET helps them find a social network too through the many programs offered to young professionals in Chicago, including JET YP.